We live in an age of constant distraction. Is there a price to pay for this? 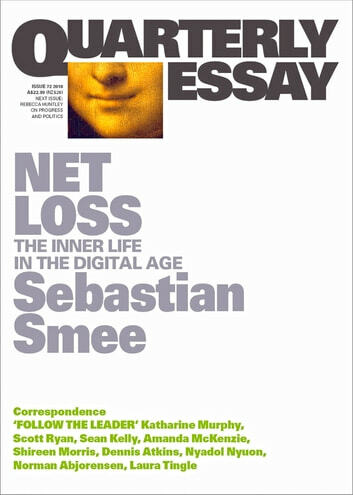 In this superb essay, renowned critic Sebastian Smee explores the fate of the inner life in the age of the internet. Throughout history, artists and thinkers have cultivated the deep self, and seen value in solitude and reflection. But today, with social media, wall-to-wall marketing and the agitation of modern life, everything feels illuminated, made transparent. We feel bereft without our phones and their cameras and the feeling of instant connectivity. It gets hard to pick up a book, harder still to stay with it. Without nostalgia or pessimism, Sebastian Smee evokes what is valuable and worth cultivating: he guides us from the apparent fullness of the app-filled world towards a more complex sense of self, and the inner life. If we lose this, Smee asks, what do we lose of ourselves? “Every day I spend hours and hours on my phone … We are all doing it, aren’t we? It has come to feel completely normal. Even when I put my device aside and attach it to a charger, it pulses away in my mind, like the throat of a toad, full of blind, amphibian appetite.”––Sebastian Smee, Net Loss.